It’s always so great to get back to Iraq. The mountains will be green and full of flowers, and I can't wait to see our students again and see the families in the refugee camps. It's funny how your pre-conceived notions of a place always seem to be dashed so quickly upon arrival. I always pictured Iraq flat, dry, and hot and maybe windy and harsh. I was nervous the first time because it's a war zone, and well-meaning friends and family told me not to go because I'd get captured by ISIS, or any number of other things. On the contrary, Iraq is a place full of amazing, delightful surprises. My perspective changed, and so did I. And now, heading back yet again, it’s so easy to be full of hope rather than fear. The area of Iraq that I’m in is called Kurdistan. Our friends Billy, Tim and Mike pick me up from the airport and we head up towards Soran a city that's about two and a half hours from Mosul. In the springtime, and especially on Fridays, people love to picnic. They load up their cars with piles of delicious food and head for the green hills where they’ll spread out blankets, feast and enjoy the beautiful weather. Life seems a little slower here. I’m tempted to have this car pull over and join a few of our friends amidst the countryside flowers. I’ve been able to visit a few different refugees camps each time I’m here, and it’s one of my favorite parts of the trip. This time is no different. As I head into the camp it’s really sweet to recognize a few different faces that I’ve come to know. We like to refer to the camps as “Micro Villages” because it sounds a little more homey, and it really is like a little village. These are people who have been torn from their homes, the places where they’ve spent their years building lives for themselves. They been forced to start from scratch with next to nothing. But they’ve done it with so much grace. It blows me away every time. They welcome me, a stranger, into their living room and we spend our time laughing over the language barrier. Then they serve me piping hot chai tea with piles of sugar and the room is filled with the sound of spoons clanking the rims of the glasses like a bunch of little bells. Then I just look around at my new friends and laugh, and honestly, there’s no where in the world I’d rather be. I feel like I always talk about Lavinas, but you know how sometimes you meet little friends who just have something special about them? That’s her. She has this brightness about her - this joy and innocence. She babbles on in Kurdish as if I can understand, and somehow, I think I do. I think she must be talking about how much she loves her family, her best friend, and her pet goat. I think she’s probably saying she loves the tea and the fresh bread her mom cooks over the open fire. She’s definitely saying she loves her new bracelet (or so I hope). I think about how her family had to flee from ISIS, when she was still a little baby. How they and 15 other families ran away together and after being trapped on Mount Sinjar, came down into the valley and found a shell of an abandoned house. They took shelter there even though there were no windows or doors and they had to build a fire in the middle of the house and hang carpets over the open windows to stay warm. Then our friend Billy and Tim found out and helped build them a village to live in. And now they have homes and food and their heard of goats gets bigger ever year. I don’t think she can remember all that, and I’m glad - because in at least some ways, she can just be a kid, enjoying the springtime. Throughout the last few days as we’ve been driving around Soran, I have noticed a lot of little shacks and makeshift homes scattered throughout the city, and I asked Billy and Tim about them. They told me they were Syrian refugee families. Often, they just find a random piece of land and build a shelter and live there until the landlord comes and tells them to move. Or they rent half finished buildings or rooms in buildings for about $100/month, but most can't afford that much. Soran has been so inundated with refugees that they have struggled to help everyone as much as is needed. I asked if we could visit some of these families and talk with them. I’m curious to learn more about how long they’ve been here, what their living situation is like and if there’s any way we can help. Tomorrow, we’ll come back and visit with a few and find out their stories. School visits are the best with these kids. And they always get so excited when @bobgoff is here! So if you want to help out, stay tuned and we’ll come up with a plan! Good morning and Happy Saturday! Today we thought we’d give you a mini tour and quick glimpse into our school for almost 300 refugee kids in Northern Iraq. It’s a place of love and joy and lots of laughter - and some of the most fun and energetic kids around! We love them so much. Hope you enjoy! @bobgoff and the kids are pretty excited about the new uniforms! Our school for refugee kids has almost 300 attending and there’s room to grow, thanks to the awesome new building that @flicker.flame, @rescueiraq and @therefugeinitiative built for them. Amazing! Today we got to tour the newest micro village. It’s within walking distance of our school so one day we walked down to say hello to the families who just moved in about 10 days ago. It’s built on the side of a beautiful hillside and has this amazing view of the valley. When we arrived, I saw this adorable little girl gang and I had a feeling we’d be friends, so I asked Sami, our interpreter, to help me talk to them. We all introduced ourselves - their names are Imam, Fatima and Melleck and they’re cousins. After a quick 30 seconds of introductions and laughing at each other I think they decided we were officially pals, so they grabbed my hands and asked me to come check out their new homes. I met their parents who beamed with pride as they gave me a tour of their house. They were still rolling out carpets and organizing the pillows in the living room so we could have tea. Sami interpreted for us a bit of their story. 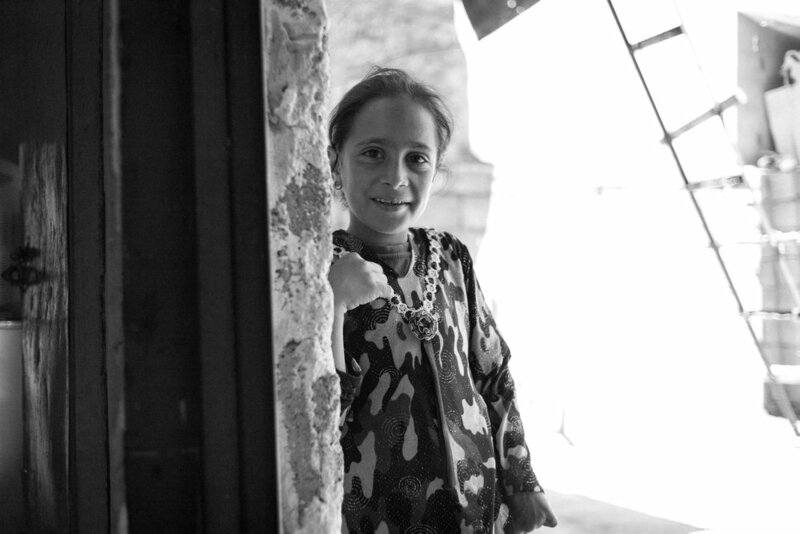 In 2014 they fled from their home villages to escape ISIS, and made their way towards Soran. Until now they were living in homes scattered throughout the city and were separated from their families, but now that Billy and Tim built this village, they could all live together again. Cousins, unless, fathers, mothers, grandmothers all in a row of houses. Since they didn’t have to pay rent anymore, they had more money for food and clothing and kerosene for their stoves. And what was super exciting to learn is that since our school is within walking distance, all the kids can go back to school! I love thinking about how Fatima, Melleck and Imam will soon be sitting in classrooms in their little uniforms, learning once again. I asked Billy and Tim what it cost to build one of these homes and it’s only $12,500! Can you imagine being able to build a whole home for that amount? My wheels are already turning, thinking about the Syrian families who need homes. Wouldn't it be amazing if all kids could have homes and safety (and hey while I'm dreaming, maybe even balloons!)? My friend Zac took this photo on an old 35mm film camera and I love it. Kids love balloons just as much in Iraq as they do in California (where I normally live) or anywhere else in the world. The setting is different - cinder block homes in a refugee village. But the important parts are the same. A little girl able to play in safety with her family nearby. We all want the same things. And now I want more than ever for all the families here to have a home. Today I want to give you a quick glimpse into one of the micro villages called Akoyan, and invite you along to our mountainside picnic! I can't always understand what these kids are saying, 😄 but we had a pretty magical time. They welcomed us with the biggest hearts. What I love the most is seeing the beautiful friendship Billy and Tim and their families have built with these refugees. It's an incredible thing to witness. If you’ve been following along our story here, you’ve probably heard me talk about the Syrian refugees and some of the challenges they’re facing. Once I met these families I couldn’t stop thinking that we can, and should do something to help. The biggest need they have is housing, and while it seemed daunting at first, so many of you have wanted to help, I think we can do it! I’m super excited to announce that we decided to build them a VILLAGE!! We have the land, the construction team, and we are launching into it a little nervous but also confident people will rally to help these amazing families. Each home costs $12,500 and we’re going to build 20 to make up a whole village. This means kids like Farah and her family can finally have a real home and she’ll get to attend our school! This will mean everything for them. If you’d like to help out, check out www.lovedoes.org/lovedoesvillage (also in bio) and donate, spread the word, start a fundraising page, anything you can do is so helpful! Over the next couple days we’ll share some more info with you but until then thank you SO MUCH for all your support already! We are so excited about this! We been little MIA because we've been putting all of our energy toward breaking ground on The Love Does Villages! We couldn't me more excited! We have been able to pay for the foundation but we have so much more to go. If you want to get involved with the project, visit lovedoes.org/lovedoesvillage.